When I was a child, the word search puzzle was either a reward for finishing your work early, or a holiday time waster, usually while the teacher was busy doing other things. I hold no grudge against my primary school teachers, but I do get that same feeling when I start up wordsearch. To be honest, wordsearch isn’t a game in the same way as curses-of-the-undead or zis. It’s riding that line, sort of like cryptoslam did, in that it generates the puzzles, but doesn’t really solve them. 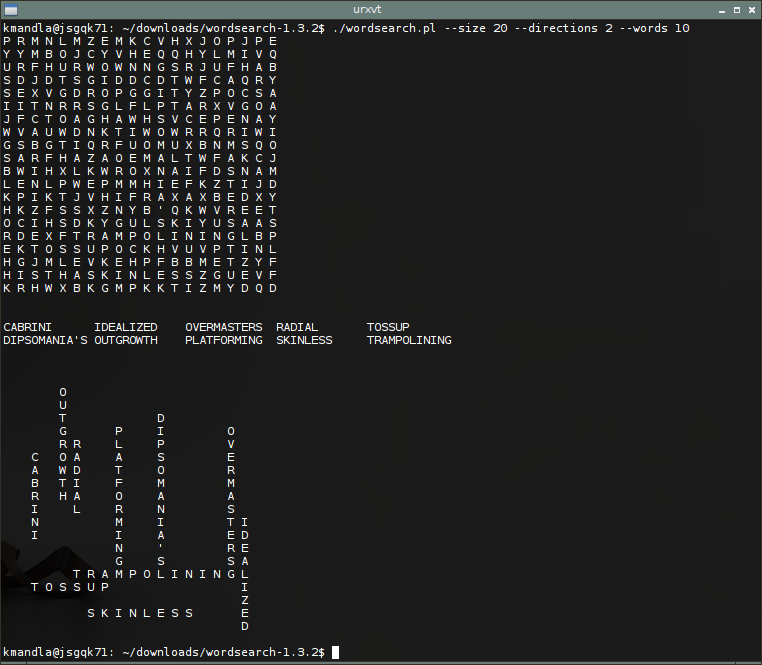 wordsearch is a perl script and in spite of the fact that the timestamps on the source files are nearly a decade old, it works fine in Arch Linux with no more prodding than the addition of the words dictionary. Debian users will no doubt have an equally easy time setting it up. Check the -h flag before you run wordsearch, because by default it will jam 50 words into a 40×40 puzzle, which is very intimidating. There are also flags to limit the directions it will arrange words, so you can ask for no diagonals, or only left-to-right and up-to-down words. I haven’t tried it, but I’m 99 percent sure you can feed any dictionary or word list you like into wordsearch, and it will dutifully generate as many word searches as a you ask. So if you’re not a native English speaker but you still enjoy pencil-and-paper word searches, I’m fairly certain wordsearch will crank them out in your language of choice. P.S. : I see there is another perl puzzle creation tool with the same name; perhaps they are related. This entry was posted in Linux and tagged game on 2014/12/03 by K.Mandla.